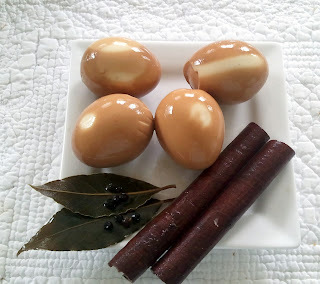 I admit that I had never made pickled eggs before. I have seen lots of recipes using beet juice, but honestly the neon pink eggs that emerge from the pickling juice really just didn't appeal to me. 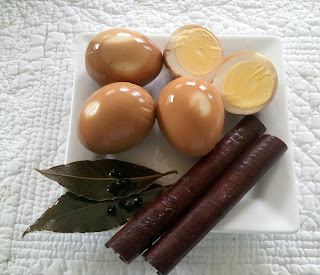 So I have been avoiding blogging about pickling eggs, despite numerous requests for a recipe. That is, until today. I was flipping through my new go-to egg cookbook, The Fresh Egg Cookbook, looking for something to make for dinner and there on page 86 was a recipe for Pickled Eggs. And they weren't bright pink - no beets involved ! Checking to see what I had on hand, I realized I was going to have to improvise a bit, but I was game to try my first pickled eggs. Submerge jars and lids in a pot of water and boil vigorously for 20 minutes to sterilize. and let air dry on a metal rack. Pour the vinegar and water into a small saucepan over medium-high heat. Add the peppercorns, cinnamon sticks and bay leaves and bring to a boil. Simmer for 10 minutes and then let cool. Peel the eggs and place three eggs in each jar, along with a bay leaf and cinnamon stick, making sure to leave at least an inch at the top of each jar. Pour enough liquid in each jar to completely cover the eggs, making sure to get some peppercorns in each jar also. The eggs are supposed to be refrigerated for two weeks, but I wanted to try one before I posted this blog. The egg is already a pretty tea color after just a a few hours in the liquid. It has a nice tangy flavor from the vinegar, and I assume that after the two weeks, the flavors of the cinnamon and bay leaf will come through a bit more. I couldn't wait any longer and just had to try these eggs ! They were delicious....and beautiful! If you would like to try the recipe from which my recipe originated, here's the link to purchase Jennifer Trainer Thompson's The Fresh Egg Cookbook. Pickling eggs is a great way to store them for eating later. Remove jars and lids from water with tongs and let air dry on a metal rack. Meanwhile hard-boil your eggs and let them cool in a bowl of ice water. Peel eggs once cool enough to handle and set aside. Pour the vinegar and water into a small saucepan over medium-high heat. Add the peppercorns, cinnamon sticks and bay leaves and bring to a boil. Simmer for 10 minutes and then let cool. Place three eggs in each jar, along with a bay leaf and cinnamon stick, making sure to leave at least an inch of headroom at the top of each jar. Pour enough liquid into each jar to completely cover the eggs, making sure to get some peppercorns in each jar also. Cover jars tightly and refrigerate for two weeks. Very interesting idea. We don't have chickens now, but if we ever do again, I may try this. Oh. My. Gosh. I HAVE TO TRY THIS! My (gross) husband LOVES those nasty pink pickled eggs from the gas station. You may have saved a marriage....HA! 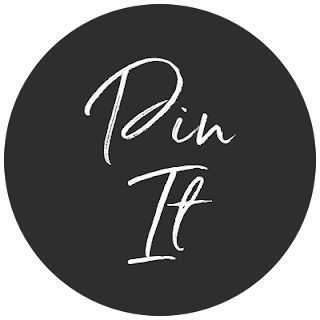 I hope you don't mind, I'm sticking it up on my linky party today so that I can find it anytime I want. Can I substitute apple cider vinegar? Thanks!